'C' Coy, 1/8th Bn, The Worcestershire Regiment, 144th Brigade, 48th Division, B.E.F., T.F. Next of Kin: Younger son of Thomas and Sarah A Turner of Rose Cottage, Malvern Common. Alfred Turner was born Great Malvern the younger son of Mr and Mrs T Turner. In September 1914 he joined the Chums Company which was raised in Malvern and formed part of the Second Line of the 8th Worcesters (first the 8th Reserve Battalion, later the 2nd 8th Battalion). 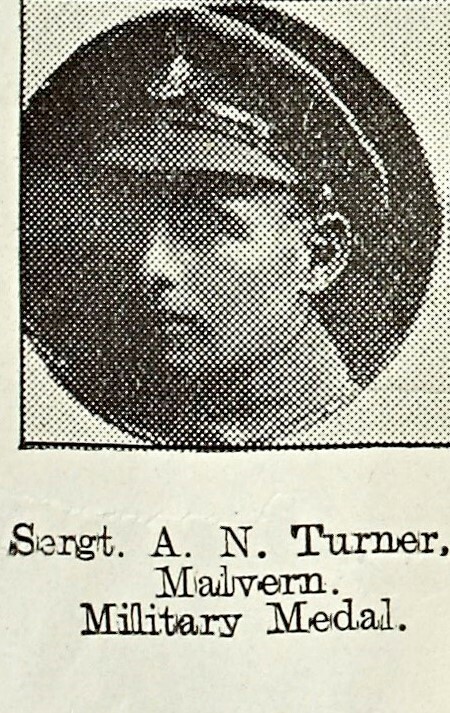 However, Turner was selected to serve with the First Line, the 1/8th and joined C Company as a draft. He was gassed on the 20th July 1916 on the Somme, along with some five hundred others in the Battalion and after several weeks was evacuated to a Convalescent Depot at Cayeux. He returned to the unit at the beginning of December to take part in action round Le Sars and the Butte de Warlencourt. He was wounded early the following year, on the 23rd February, but not seriously. He was promoted to Corporal at around this time and took part in the attacks on The Mound at Templeux-le-Guerard and Gillemont Farm in April, and the Passchendaele, or Third Ypres Offensive August – October. He the Military Medal for bravery in the field on the Steenbeek during the opening phase of this Offensive in August 1917. After the Battle of Langemarck, during which the the 1/8th Worcesters made an attack on the 9/10/17, the battalion moved to Italy. During November they travelled south to Marseilles and then east along the Mediterranean coast. It was here in January 1918 that Alfred Turner, by this time an Acting Sergeant was killed by the accidental discharge of a rifle, while out of the line. The Captain of his Company wrote to his parents: “All the officers wish to express their sympathy to you. Your son was well liked by every one. He always did his duty most nobly and conscientiously.” A Chaplain says: “We all mourn the loss of a gallant soldier and comrade.” The Sergeants of the Company also expressed their sympathy.